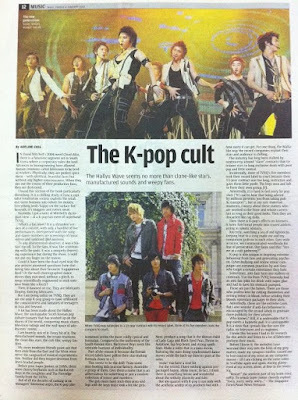 While at work flipping throught the newspapers, I came across this article titled, The K-pop cult with the images featuring TVXQ & Super Junior. While I was supposed to be looking at competitor's advertisements, I couldn't help but continued reading the article. Upon consuming the entire article, I could certainly relate to the writer's experience. 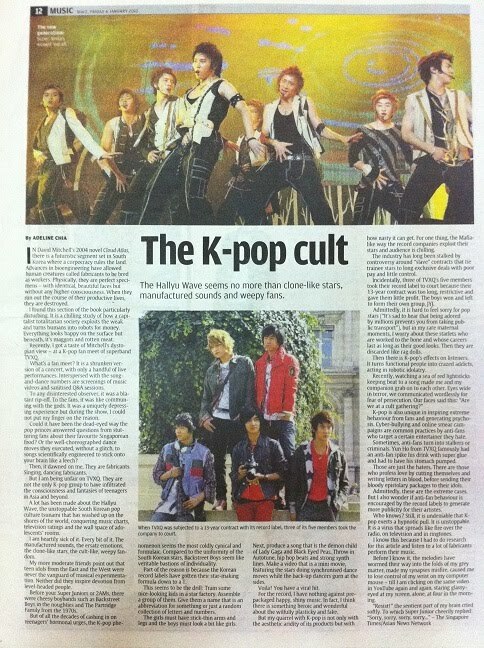 I couldn't agree more with the writer's description on how cult-like K-pop fandom can be. If you've been following my blog for the past few years, I'm sure you're aware that I was once a big fan of TVXQ or fondly known as DBSK. On a daily basis - without fail - I would stay in front of the computer for hours just downloading TVXQ stuff (MVs, songs, live performances, variety shows etc.) when I should be getting started on my college assignments. Then, there's the hard-to-resist new album releases with several versions packaged in the coolest or most beautiful box you've ever come across. In fact, I almost owned all their CDs & DVDs and treated them as my prized collection cuz they were imported from Korea or Japan. And I had the opportunity to attend their concert twice when they stopped over at Malaysia. While I considered my sanity kept in check by hanging out at the concert venue 6 hours before it starts, my friend was crazy enough to stalk them right from their arrival at airport until the late night rehearsal before the concert. Soon enough, 3 members of the group were plagued with a court case between their management/record label SM Entertainment for binding them to a slave contract that was too long, restrictive & low pay. Due to this, their activities were drastically reduced & I saw less of them. When Junsu, Yoochun & Jaejoong won the case, I supposed the relationship with SM turned sour & ended with a tragic split from the TVXQ to form their own group called JYJ. Meanwhile, Yunho & Changmin remained in TVXQ & continued to promote their works via SM. As predicted, my interest for all of them wane quickly cuz I was heartbroken with the split. When the love for them was lost, whatever prized collection I have seemed like heaps of trash taking up unnecessary space. But never got to selling any of it cuz deep down inside, I couldn't. TVXQ was indeed a talented group which possess versatile voices & fancy dance moves, unlike the new generation of K-pop boybands with engineered sounds & Autotuned, churning songs after songs that are forgettable. Unlike what the writer said, I wouldn't consider TVXQ as robots that have passed its lifespan & discarded as rag dolls. The band still lives on anyway - only with 2 members while the 3 of them took different career paths. I never regretted being part of this K-pop worshipping cuz it cheered up my life & made me some new friends (though not long-lasting). Now I'm glad that I put an end to it cuz the fandom was draining my moolah faster than I could ever imagine.